One of the joys of being pagan is that there are no rules; another is that drawing from an eclectic array of traditions is not only acceptable, it the norm. One from which I’ve drawn several customs is Native American, including using a burden basket, which is the topic of this column. 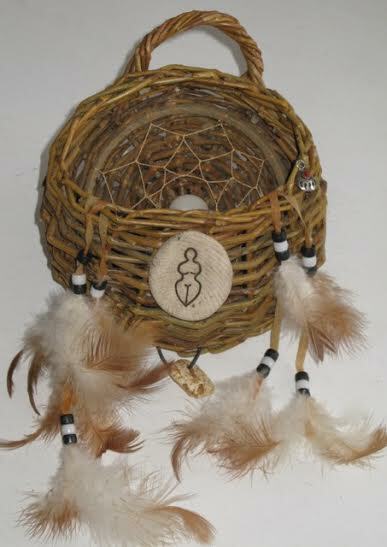 Apache women wove cone-shaped baskets to hold the wild foods and useful things gathered during the day. 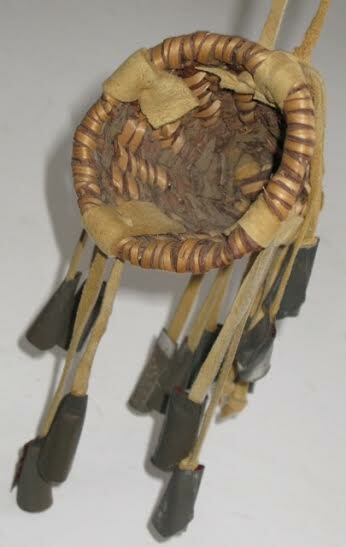 The baskets had a carrying strap that was worn around the head or the shoulders, leaving the arms and hands free. Baskets were decorated with cone jingles, animal skin, symbols and other objects. Upon arriving home, the basket would be emptied of its contents and hung outside the door. Burden baskets can be used these days to symbolize the loads we carry, the things we pick up during the day and the belongings we hold on to and don’t want to let get go of: obligations, beliefs, schedules, fears, plans, injuries. By hanging a burden basket on the outside of your door, you will be reminded to put your burdens in it, and not bring those troubles into your home. At first I sought to find such a basket at pow wows and online stores, but then decided to make my own. Over the course of a few weeks, I found a small basket at a tag sale that felt right. I set it by my altar and in a few more days, I remembered a small dream catcher I had been given. Cleaning out a drawer, I came across a box with some earrings whose partners were long since gone and pulled out a bear claw. Then I came across a beautiful round white stone I had picked up on a beach more than a decade ago. On a full moon, I put them together, adding a Goddess pin and a hag stone. Inside I placed a crystal and some sage. When I come across the right shell, I will add it as well. I hung it outside the door I most use and liked how it was always there to welcome me home. Then almost immediately, I found a small version of the more traditional burden basket at a tag sale, so I got it for my other door. They are different, but they both remind me that the burdens I carry can be put down, and that I can choose to pick them up again … or not. Perhaps making one will do the same for you. It doesn’t even have to be a basket, and it doesn’t have to be outside your door. When my coven gathers for ritual, we pass around an old alligator purse with a clasp that gives a very satisfying click when closed. Inside is a Goddess figure. As we pass it, we each put in what we carried to our circle that would detract from focusing on the present moment. At a discussion group, we pass around a decorated box with a piece of Himalayan salt inside, and at a retreat, we pass around a covered casserole dish. All are then placed outside the room (or the house) and the contents later offered to the wind.